Most of these chants were recorded in the temple of the Ramakrishna Monastery at Trabuco Canyon, California. The domed shrine adds a sweet, sonorous, resonant sound. 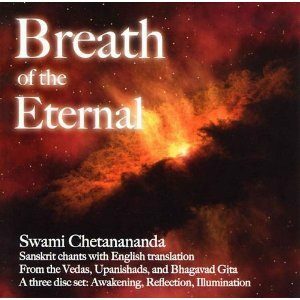 English translations are selected from the writings of Swamis Yatiswarananda, Nikhilananda, Prabhavananda, and other sources. Symphony of 5,000 Years – Silence is Brahman. Sound is also Brahman. Sound originates from the Infinite Silence, then manifests as finite name and form, and again merges into the Infinite Silence. The One becomes many – this is the play of maya. 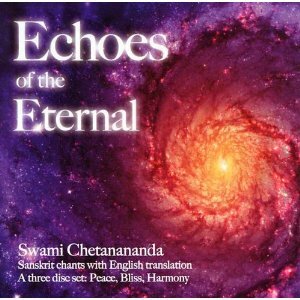 Swami Chetanananda, the Minister of the Vedanta Society of St. Louis, played with the sounds of Peace, Bliss, and Harmony in this series, Echoes of the Eternal. 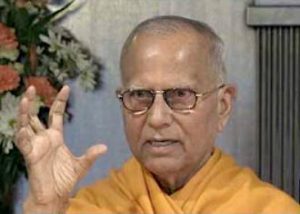 Through the ancient chanting tradition of Vedanta, he has evoked the moods of Devotion, Knowledge, Action and Meditation. 14. Shariram surupam sada: You might have beauty, wealth, learning, but if you have no love for God, what does it avail?